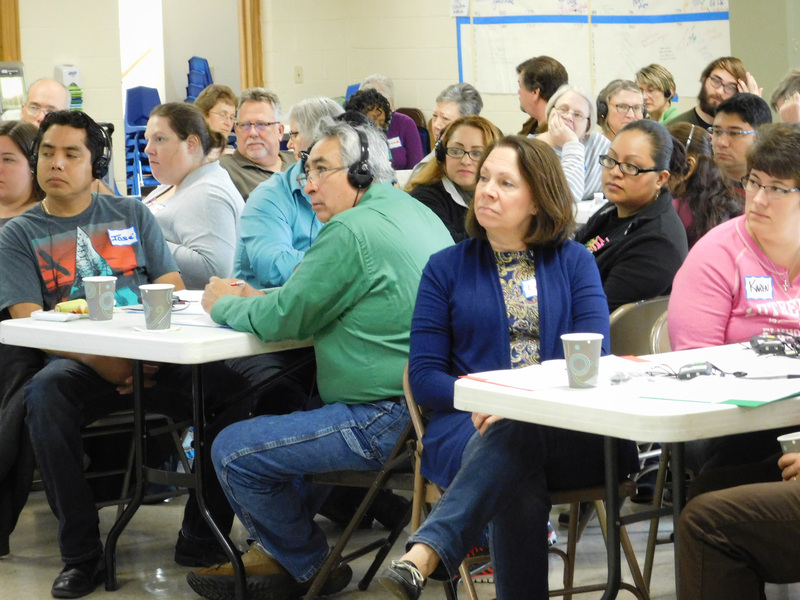 Over sixty Lutherans from congregations around the Greater Milwaukee Synod, together with two leaders from the Racine Interfaith Coalition, met at Emmaus for three days in October for an intense Anti-Racism workshop. The Synod Anti-Racism Team and FaithWorks co-sponsored the training. FaithWorks made it financially possible for over 30 members of the FaithWorks congre-gations to attend without cost, making the training the largest in the history of such workshops offered by the Synod. Emmaus/Emaús had the largest representation within the group, including six members of the EASY (Emmaus After School for Youth) staff. Three high school students were excused from a day of school in order to attend the full training. Crossroads facilitators Jessica Vasquez Torres and James Addington provided an historical background and a thorough analysis of how institutional racism impacts us at all levels. Examples of the depth of the oppression for people of color were cited, some coming from first-hand experience of those attending the workshop. Simultaneous interpretation was provided through headphones, and both Spanish speaking and English speaking participants had the experience of hearing the presentation translated into their own language at different points of the training. According to several of the English speakers, it was an eye-opening experi-ence to find out what it was like to understand another language through an interpreter. There is high interest in continuing what was begun, as we of FaithWorks congregations strive to move along the continuum of what it looks like to be part of an institution that addresses and confronts racism. We are now in conversation with community leaders, including the mayor and leaders from other faith communities, about how we can join together to collaborate with one another in the wider Racine community. It is the hope of the FaithWorks Mission Council members that there will be future funding to allow for training for community interpreters as well as for further anti-racism training events in the Racine area.